Raspberries are ready for picking. Our favorite Raspberry Pie has a combination of silky custard that the raspberries lay on with a tender flaky crust. and fill to the 1/2 cup line with ice cold water. In the food processor, put all the dry ingredients. Add the cut up lard, pulse this until the big pieces are all gone. Add the liquid quickly while the machine is going. Stop it as soon as it starts to come together. Turn it out onto a counter and knead it a few times until it comes together. If you don't have a food processor, put the dry ingredients into a large bowl. Cut the lard into tablespoon pieces and then cut into the flour mixture until it looks like oatmeal. Add all the wet ingredients and stir with a fork until it just comes together. Divide the pastry into 3 equal pieces, flatten into round discs, wrap in plastic wrap and refrigerate for about 30 minutes. Roll one disc of pastry onto a floured counter. Roll pastry out about 1/8 inch thick and line your pie plate. This recipe will do two 9 inch crusts. Roll the pastry onto the rolling pin and unroll it onto the pie plate. Trim the edges and prick the bottom and sides of the pastry. Put a piece of foil over the crust, pressing it slightly onto the crust. Put it into the oven and bake 10 minutes. Remove the foil and bake a few more minutes until lightly browned. Let cool. Refrigerate the remainder pastry discs a few days or freeze. Blend the sugar, cornstarch, and salt in the medium saucepan. In a measuring cup, measure the milk and then add the egg yolks and stir. Add to sugar and cornstarch mixture. Cook over medium heat stirring constantly until bubbling and thickened. Pour into cooled pastry crust. Add one layer of berries on top of the cooled custard. In a small saucepan, stir together the jam, water, and cornstarch. Heat until just bubbly and clear. Drizzle over the berries. You don't need much .. just a bit to add a bit of sweetness. Whip 1 cup of heavy cream with 2 tablespoons sugar until soft peaks form. Slice the pie and top with whipped cream. Sounds wonderful. I just made a peach cobble last night, but I may have to give this one a try. On a smaller scale as no one else in the house like raspberries, go figure! Loven your blog and all the wonderful recipes. Can I have a piece for breakfast ?? Raspberry is my favorite berry! Yummm. Pie...and raspberries...two of my favorite foods! This is beautiful..wish I had a large piece now to go with my coffee! I just shopped yesterday and bought the ingredients for the apple cinnamon streusel muffins and the swiss garlic bread. I'll let you know how they turn out ~ can't wait!!! Please tell me what you use for Lard. I am a non-baker/cooker (at least till I found this blog) so I'm sad to say I don't know what is used for some thing. Do you use Crisco, tub of margarine, butter, ??? Thanks for ideas. I have raspberries in my garden so this would be great to try! Thanks! Michelle, Here in Canada we have tenderflake lard. . .it isn't shortening. . nor margarine. .
You can use shortening if you can't fine Lard. . .It doesn't really matter what brand you use. I just find that Lard. . .is great for flaky crusts. Mmmm..I could go with a piece of this delicious looking raspberry pie! 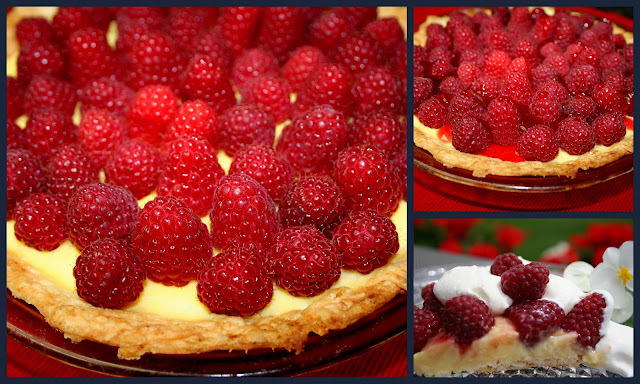 I can hardly wait till my raspberries are ripe..I will definetly be making this pie. This sounds so delicious! I just passed up the fresh raspberries in the store today. Darn! I should've followed my heart and bought them. Next time! Raspberries with custard has got to be one of the best combinations! Your pie looks wonderful! . . . I'm sure it was.